Organization is a great thing, really. Plan ahead and save time. A place for everything and everything in its place. Terrific concept isn’t it? So why do ADHDers have such a hard time applying these concepts? It isn’t that organization is a bad word to us, or that we all universally hate it, or even because we are all anarchists at heart. It’s just something that we don’t know how to do very well or we want to do perfectly. We’re too busy with being busy, fighting off distractions of every make and model and, well, we simply just forget. Sometimes items end up in piles rather than where they belong, and important stuff like car keys, wallets, and purses get misplaced. We spend an hour looking for one certain thing and are positive that it’s somewhere nearby, we just can’t locate it at the present moment. Life becomes chaotic and relationships a struggle. Mornings are my biggest organization foe. I hate them more than I hate Brussels sprouts. This is how I avoid chasing my tail and put a stop to the drama before it starts. It’s time to free your mind from the extra junk. Getting organized with ADHD all begins with developing a routine. 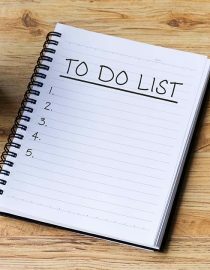 By having a daily ADHD routine plan structured into your life, you may find a sense of organization in your life. From using color-coded post-it notes to planning ten minutes at night for tomorrow’s tasks – you’ll also, and hopefully, be able to get organized with ADHD too! Related VideoADHD and Clumsiness – What’s the Link? I love them and think they are awesome. I use them with my own color-coded system for a quick, at a glance rundown. Red is for jotting down my thoughts when I get interrupted and don’t want to forget whatever it was that I was musing on, yellow is for bills that have to be paid ASAP (like the next day), and green is for my grocery lists. You get the idea. At the time of the writing of this article, I’m actually lining my post-its up by the front door, where I can’t miss them. The fail-safe to this method is that even if I do miss the obvious, my son or partner won’t, and will point them out as we are getting ready to head out. Some people like to use a day planner in conjunction with their notes. I applaud them, as this is a level of organization I’ve yet to achieve personally. Next page: Household organization tips and planning for tomorrow.